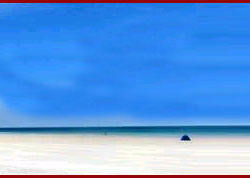 The India Travel Destinations takes you on travel to the most romantic city Agra in Uttar Pradesh, India. Agra is the most important center of tourism in Uttar Pradesh, India and is famous all over the world for the lovely Taj Mahal, a memorial that was constructed by the Mughal Emperor Shah Jahan. Agra city is the one of the famous destinations of the World Tourism with three tradition monuments -The Taj Mahal, Fatehpur Sikri & Red Fort. Agra is an energetic centre of Culture, Art and Religious philosophies that have enriched mankind and shaped human thought over centuries. Agra is famous for handicrafts products such as engrave work on Marvel, Leather work, Footwear, Brasswear, Carpets, Jewelry, Zari and Embroidery work. 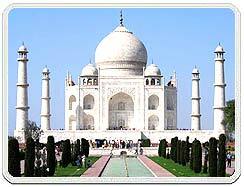 We provide information on tourist destinations in Agra Travel including the beautiful Taj Mahal. Agra tour is one of the most popular travel places amongst tourists. Taj Mahal is one of the Seven Wonders of the World built by Emperor Shahjahan. Taj Mahal is also a symbol of enduring love, built by Shahjahan to house the grave of his beloved wife, Queen Mumtaz Mahal, who died following the birth of their 14th child. Taj Mahal, a dream fearful in milky white perfect marble is the superior monument showing the beauty of everlasting love. Taj Mahal is certainly India's rich tribute to womanhood. This brilliant marble structure took over 21 years to make and is the best jewel of art and architecture of the Mughal age. Famous for its artistic beauty, this spendthrift building of timeless beauty is the outcome of a fashionable combination of passion and architectural enthusiasm. Taj Mahal of Agra stands on the bank of River Yamuna. The Taj Mahal is one of the most gorgeous masterpieces of design in the world. Agra placed about 200 km south of New Delhi. Taj Mahal is the tomb of the Mughal Empress Mumtaz Mahal. After 22 years, and the mutual effort of over 20,000 labors and master craftsmen, the tomb was finally completed in 1648 AD on the banks on the river Yamuna in Agra, the 17th century capital of the Mughal monarchs. The colors of the Taj Mahal change at different hours of the day and during different seasons. The Taj Mahal of Agra is pinkish in the morning, milky white in the evening and golden when the moon shines. Like a jewel, the Taj Mahal sparkles in moonlight when the semi-precious stones inlaid into the white marble on the main tomb catch the shine of the moon. These changes, they say, represents the different moods of woman. The source of the name "Taj Mahal" is not understandable. Court histories from Shah Jahan reign only call it the tomb of Mumtaz Mahal. 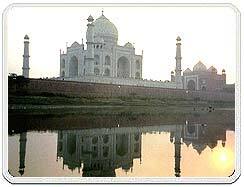 It is generally believed that "Taj Mahal" is shortened version of her name, Mumtaz Mahal. Air : Agra has its own airport, so accessibility by air is not a problem. Rail : Agra has well laid railway tracks, which is connected to all the major cities of India. Road : Agra is well linked to all the major cities of Uttar Pradesh. which are easily approachable from any part of India.